But other people who've built fusors suggest an acrylic tube. I am unable to find sufficient documentation to work out what to purchase. 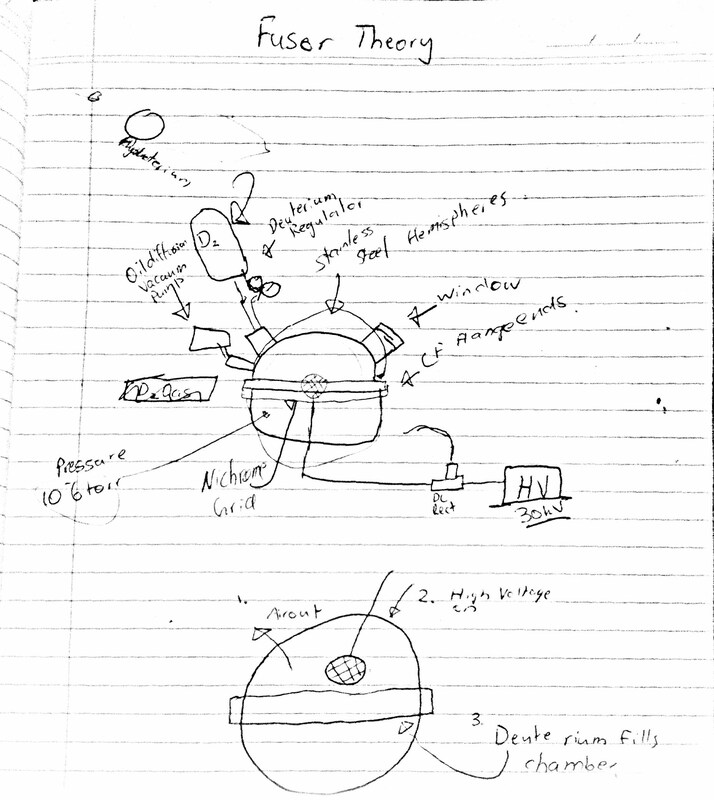 Re: What vacuum chamber do I use? No plastics ever! Period. No glass ever.....If you want to do fusion. Cool. I can do that... probably. I've attached a couple of scans detailing the design of a fusor. My design will probably differ due to parts availability, but this is the theory..
An alternative to the hemispheres is a smaller (2 to 4 inches) "pipe tee" fusor. The major advantage with a four way cross is that for a given voltage (as little as 25 kV and around 20 ma) one can obtain an easy to detect neutron signal. These small "chambers" work at significantly higher pressure, and are very easy to assemble. Having the four "ports" allows all essential connections to be installed (view port, vacuum pump down, gas inlet and high voltage connection.) As for cost, finding these on ebay as good deals isn't to difficult and compared to a custom chamber, about as inexpensive a route as possible. The ID for the cross was a std 2.75" if memory serves. There have been at least two people entering the fusor neutron club who used this methodology. Do search these results (occurred in the last two years) and read their approaches and results. For a four-way cross, really no need for welding. Drilling, maybe. But simple KF fittings for the covers and using covers that have pre-made window/connectors make the job rather easy. The issue is finding the right pieces at the right price on ebay - patience is the key. Do you know a place where I can get a cross? I have a potential 2000 dollar AUD budget but I think most of it will be used on the pumps or the deuterium. Do you have any pictures?